Now that I’ve finished recapping my Eastern European trip from last September, I wanted to share a recipe for a classic dish from one of the countries I visited. Taking into consideration the freezing cold temperatures outside in New England right now, and my souvenir stash of paprika from Budapest, I settled on paprikash. It’s a Hungarian dish traditionally made with chicken, but since I ate my weight in mushrooms during those 2 weeks, I figured I they might as well work here, too. As both a pasta fan and meat foe, I appreciate the joys of a good noodle, tomato, and cheese casserole. Popular and portable, this baked ziti from the culinary maestros at America’s Test Kitchen has recently become my favorite “pasta casserole.” Baked ziti is great because it doesn’t require the layering of a lasagna or stuffing of shells, and this version is superb. Thanks to a secret ingredient, the cheese and sauce stay rich and creamy (not rubbery noodles and gummy cheese here). Asparagus is a welcome sight in the produce section this time of year. It means spring has truly arrived, even if it doesn’t quite feel that way yet outside in chilly New England. Two of my current goals are to 1) challenge myself more in the non-baking realm, and 2) become more comfortable with using seasonal vegetables. 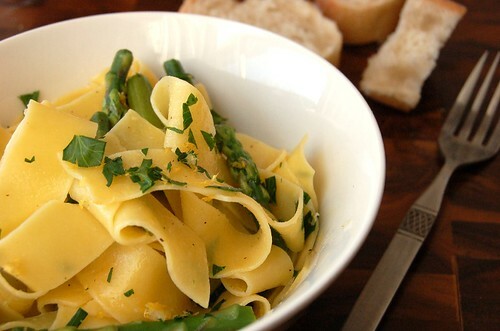 Bearing both of these in mind, I decided to try a recipe for Pappardelle with Lemon Gremolata and Asparagus from the April 2011 issue of Health magazine. A treat I always looked forward to on my birthday was choosing anything I wanted for supper, and every year I asked for the same thing…cheese ravioli. I am and have always been macaroni crazy. It’s a rule when you’re Italian, even if you look Irish. Stuffed shells were (and are) a fixture on our Thanksgiving table. Right after the Italian wedding soup and before the turkey. When I stopped eating meat ten years ago my Nana’s stuffed shells essentially became my Thanksgiving dinner, and I can’t imagine anything more delicious…unless it’s Courtney’s veggie lasagna, which has also become a recent holiday tradition.